Commissioner Shannon Whitfield presents a proclamation and plaque to Frank Richardson for his 46 years of service on the Walker County Planning Commission. Thursday night at the Walker County Commissioner's meeting was one of special recognition and appointment for three county residents. First, Commissioner Shannon Whitfield proclaimed February 2, 2019, as Frank Richardson Day in Walker County for his 46 years of service on the Walker County Planning Commission. An official proclamation urges "all citizens and employees to join in congratulating Mr. Richardson for his meritorious service, loyalty and dedication rendered to this community, and recognize the valued contributions he made to improve the lives of Walker County citizens." Two special appointments were also made. Robert Wardlaw, the county's current Economic and Community Development director and the voice of the county's Walker Rocks tourism initiative, was appointed as a representative of Walker County on the Board of Directors of the Northwest Georgia Joint Development Authority. Wardlaw replaces Melody Day, whose term expired on Dec. 31, 2018. The other appointment was that of Dean Kelley as a member of the Alcoholic Beverage Commission of Walker County. In other business, Commissioner Whitfield signed a Memorandum of Understanding (MOU) between Lookout Mountain Judicial Circuit Multi-Jurisdictional Drug Task Force local government participants, which includes Walker County, Chattooga County, Dade County, and the cities of LaFayette and Fort Oglethorpe. This MOU authorizes joint funding of the Drug Task Force and allows solicitation of grants to help fund the task force. A purchase order was also signed for the purchase of two new Dodge Chargers from Jenkins Chrysler-Dodge-Jeep Inc. for the Walker County Sheriff's Office. The vehicles, costing $22,026 apiece, will replace two department cruisers totaled in accidents. Whitfield also acted upon three rezoning requests after their consideration and hearing by the Walker County Planning Committee and after a second public hearing prior to the Commissioner's meeting Thursday. A request by John and Cheryl McCarthy to rezone from R-2 (residential) to A-1 (agricultural) property located at 424 Straight Gut Road, Rock Spring, was approved to allow the McCarthys to develop a mini-farm on their property for their retirement years. A request by Home Eclectics Inc. to rezone property at 905 LaFayette Road, Rossvile, from C-1 (commercial) to R-2 (residential), upon the recommendation of the Planning Commission, was also approved. A third rezoning request was by David Coker, who asked that property on Drew Lane, LaFayette, be changed from A-1 (agriculture) to R-2 (residential). The county Planning Commission had earlier tabled Coker's request until some questions could be clarified, so Whitfield likewise tabled that request until the Planning Commission could act on the request first. Commissioner Whitfield also discussed the eight community forums to be held throughout Walker County during February, noting that he "looked forward to hearing about the topics important to folks in Walker County and their thoughts on how we can improve county services." He said county leaders wanted "attendance and participation" and stressed that 75 percent of the forums' time would be devoted to audience participation, especially comments and questions. Robert Wardlaw said the forums were opportunities for county residents "to share ideas and thoughts" on how to improve Walker County. In summary, Whitfield said his goal for the forums was to "focus on the future" of Walker County and to "try to energize everybody to move things forward." PJ Doyle recently lost his father, Drug Task Force commander Patrick Doyle, to cancer. Lookout Mountain Drug Task Force Commander Patrick Doyle died several weeks ago, and his family has taken a unique approach moving forward. "In lieu of flowers, our family asked that people donate to [our son]'s college fund," explained Doyle's wife, Dacia. PJ Doyle is studying agricultural education at Abraham Baldwin Agricultural College and was the light of his father's life and his pride and joy. In Doyle's obituary, the following was stated: "The title he cherished above all was 'Dad'. There was nothing in this world that he loved more than his son, PJ." It is evident in the family's wishes that this rings true. To donate, visit The Bank of Lafayette, with which the college fund account is placed. Patrick Cook and Greg Ramey are the two people on the account along with PJ Doyle. 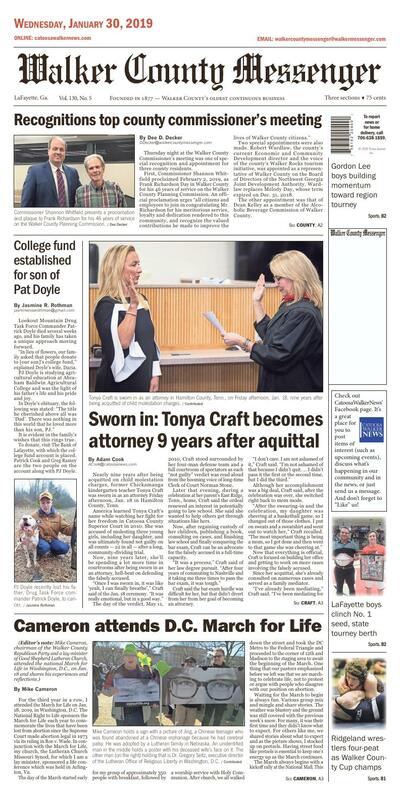 Tonya Craft is sworn in as an attorney in Hamilton County, Tenn., on Friday afternoon, Jan. 18, nine years after being acquitted of child molestation charges. The day she was acquitted, May 11, 2010, Craft (bottom right) said she wanted to go to law school and become an attorney. Standing from left: Attorneys Cary S. King, Scott King, and Clancy Covert. Sitting, from left: Dr. Demosthenes Lorandos and Tonya Craft. Nearly nine years after being acquitted on child molestation charges, former Chickamauga kindergarten teacher Tonya Craft was sworn in as an attorney Friday afternoon, Jan. 18 in Hamilton County, Tenn.
America learned Tonya Craft's name while watching her fight for her freedom in Catoosa County Superior Court in 2010. She was accused of molesting three young girls, including her daughter, and was ultimately found not guilty on all counts — 22 in all — after a long, community-dividing trial. Now, nine years later, she'll be spending a lot more time in courtrooms after being sworn in as an attorney, hell-bent on defending the falsely accused. "Once I was sworn in, it was like 'yeah, I can finally breathe'," Craft said of the Jan. 18 ceremony. "It was really emotional, but in a good way." The day of the verdict, May 11, 2010, Craft stood surrounded by her four-man defense team and a full courtroom of spectators as each "not guilty" verdict was read aloud from the booming voice of long-time Clerk of Court Norman Stone. Later that evening, during a celebration at her parent's East Ridge, Tenn., home, Craft said the ordeal renewed an interest in potentially going to law school. She said she wanted to help others get through situations like hers. Now, after regaining custody of her children, publishing a book, consulting on cases, and finishing law school and finally conquering the bar exam, Craft can be an advocate for the falsely accused in a full-time capacity. "It was a process," Craft said of her law degree pursuit. "After four years of commuting to Nashville and it taking me three times to pass the bar exam, it was tough." Craft said the bar exam hurdle was difficult for her, but that didn't divert from her from her goal of becoming an attorney. "I don't care. I am not ashamed of it," Craft said. "I'm not ashamed of that because I didn't quit. ... I didn't pass it the first or the second time, but I did the third." Although her accomplishment was a big deal, Craft said, after the celebration was over, she switched right back to mom mode. "After the swearing-in and the celebration, my daughter was cheering at a basketball game, so I changed out of those clothes. I put on sweats and a sweatshirt and went out to watch her," Craft recalled. "The most important thing is being a mom, so I got done and then went to that game she was cheering at." Now that everything is official, Craft is focused on building her office and getting to work on more cases involving the falsely accused. Since her acquittal, she's already consulted on numerous cases and served as a family mediator. about four years now and I've been consulting for about seven. My office is Tonya Craft Legal, so I'm going to do mediation, consultation, and litigation." Lately, Craft said, she's worked on cases in Hawaii, New Jersey, Florida, Alabama, and Georgia. A man who was acquitted in the first case Craft consulted on even made the trip up from Florida to see her sworn in. "We ended up getting his kids back after the criminal trial when he was acquitted and he we was able to be here," Craft said. "That was just great." Also in attendance during the swearing-in were two of her attorneys from her criminal case: Dr. Demosthenes Lorandos and Cary King. Having both with her during the ceremony was special and fitting for the trio. "Doc and Cary were there with me and they went with me from my office over to the courthouse," Craft said. "It's funny because the last time we were all together in the car was when we were going to the courthouse for the verdict. We talked about how very different the atmosphere was." Craft said she and Lorandos have written a chapter together in a textbook about forensic interviews and investigations focused on examples of how they are handled properly and improperly. Craft said she's working with another of her attorneys, Scott King, to create a special team to work cases like hers. "Scott and I actually are working. ... Our goal is to make it where anybody in the nation that is falsely accused can have a great team come in and defend them," Craft explained. "We want to build what I wish I could have found — a whole team to come in and defend me. I couldn't (at the time), so I had to put this team together and build it. We want to have the team already built. It's really neat because all these people who worked on my case, I'm pretty much working with all of them in certain capacities now." Recently, Craft has been working with a Los Angeles-based production company on a documentary that will chronicle her story. "The documentary folks were there filming at the swearing-in," Craft said. "They filmed me getting ready that day and then we got in the car and went driving around Chickamauga. We were in front of the house that I lived in with the kids. We went over to the school board building and by the elementary school and just kind of talked about stuff." In addition to having attorneys, clients, and supporters in attendance, Craft said the best part was having her children and husband there. "The kids were there. They've been there through the whole thing and they're real excited and proud," Craft said. "They were really sad for me when I didn't pass the bar the first time. ... TEhat was the first test I've ever failed in my life. I cried for two days. It's only offered twice a year. So essentially, I studied for a year and a half for that thing. I was so over it. It was great having them there with me when I finally got sworn in." Although the documentary is in production, a solid release date hasn't been announced yet. "For the documentary, I've been out to LA three or four times over the past year," Craft said. "It's going to be a six-episode documentary. The first few episodes are all the pre-trial stuff, the trial and verdict, and then right after it. The stuff they're filming now, the swearing-in, is the first stuff they videoed in live time. They're going to be back and filming some things over the next six to ten months. It'll be probably about a year before it airs." Craft said that when it came time to choose a production company to work with in LA, her daughter flew out there with her to sit in on meetings. "She said she wanted to help make that decision, which was fine because it is kind of 'our' story, you know? It's not just mine. She and I have done a lot of this together, so it's been really special. I'm blessed and I'm excited." Nine years is a long time to process the events that took place — how they affected Craft, her children, and how they've altered the course of her life. "When you go through something really difficult, you have to accept that things are never going to be the same again," Craft said. "It'll never go back to the way it was. Like with passing the bar — I feel like I have been punched in the face a thousand times. I've been knocked down, but it's not about getting knocked down, it's about making sure you get back up. There were times, especially during the trial, when I wasn't scared of getting knocked down. I was scared there was going to be a time when I couldn't get back up." The way her case played out really created a less-than-stellar perception of both Walker and Catoosa counties, and the local legal system. However, Craft said she won't let that keep her from visiting the area. "There's a small group of people that did a really bad thing and made some really bad choices," Craft said. "Those choices affected me, affected my children, other people's kids, other adults. But still, Chickamauga, Catoosa County, all that area ... they are good people and I go there frequently. I have friends there and I'm not going to shy away from going there. Any kind of black eye that's been put on that community has been done by the Lookout Mountain Judicial Circuit (which prosecuted the case). There are some people there that have done some bad things, but the community is a great community." Craft's groundbreaking case was one of the biggest trials to occur in Catoosa County, and it launched her into the public eye as a poster woman for the falsely accused. Although the case continues to open a lot of doors, Craft said things could have easily been different. "Everything that's happened and the opportunities that I have, the blessings that are happening, I appreciate greatly," Craft said. "But I didn't ask for it and I didn't want it. I would love to be teaching kindergarten and for nobody to have heard of Tonya Craft except little kindergarteners. I would love that, but that's not the case." Mike Cameron holds a sign with a picture of Jing, a Chinese teenager who was found abandoned at a Chinese orphanage because he had cerebral palsy. He was adopted by a Lutheran family in Nebraska. An unidentified man in the middle holds a poster with his deceased wife's face on it. The other man (on the right) holding that is Dr. Gregory Seitz, executive director of the Lutheran Office of Religious Liberty in Washington, D.C.
Pretzels help Mike Cameron and many other marchers keep their energy up during the March for Life. Vice President Mike Pence speaks to the crowd of nearly 400,000 during the annual March for Life rally in Washington on Jan. 18. For the third year in a row, I attended the March for Life on Jan. 18, 2019, in Washington, D.C. The National Right to Life sponsors the March for Life each year to commemorate the lives that have been lost from abortion since the Supreme Court made abortion legal in 1973 via its ruling in Roe v. Wade. In conjunction with the March for Life, my church, the Lutheran Church Missouri Synod, for which I am a lay minister, sponsored a life conference which was held in Arlington, Va. The day of the March started early for my group of approximately 350 people with breakfast, followed by a worship service with Holy Communion. After church, we all walked down the street and took the DC Metro to the Federal Triangle and proceeded to the corner of 12th and Madison to the staging area to await the beginning of the March. One thing that our pastors emphasized before we left was that we are marching to celebrate life, not to protest or argue with people who disagree with our position on abortion. Waiting for the March to begin is always fun. Various group mix and mingle and share stories. The weather was blustery and the ground was still covered with the previous week's snow. For many, it was their first time and they didn't know what to expect. For others like me, we shared stories about what to expect and as the picture shows, I stocked up on pretzels. Having street food like pretzels is essential to keep one's energy up as the March continues. year, Vice President Mike Pence addressed the March in person, while President Trump addressed the March live from the White House. Rev. Matthew Harrison, president of the Lutheran Church Missouri Synod, also addressed the crowd. After the rally, the March slowly began. Each group had a designated spot to enter the March. This takes a little time because the crowd at this year's March was estimated at between 350,000 and 400,000 people (well over what the media reported). Our group carried signs with faces on them representing the Lutheran Church's Eyes of Life program. One face on a sign was Jing. He was found abandoned in an orphanage in China, unwanted because he has cerebral palsy. By God's grace, Jing was found and adopted by a family in Nebraska. On the back of the signs were hymns which we sang along the March route. It took between 2-3 hours, but finally everyone made it to the end of the March at the Supreme Court. My group headed back to our hotel to continue our conference where we discussed subjects like how to treat people in our congregations with disabilities and also the culture of death in America related to the legalization of assisted suicide. As one speaker put it, our lives are not our own; they are a gift from God whose only son paid for our sins with his life on the cross. All life is precious; we should do all we can to preserve and enrich it.